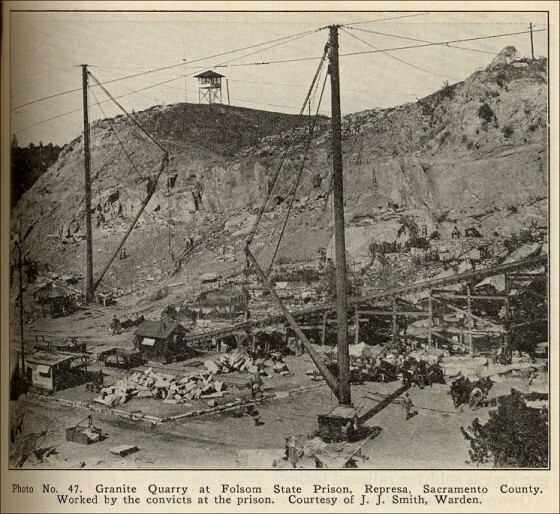 On our tour we share information on the “Folsom Potatoes” We just ran across this picture from the rock quarry that the prisoners worked into forms these out of granite. Used as ballast in the ships coming up the Sacramento River or from the Bay Area, many of the streets in Seattle, Portland, and San Francisco were initially paved with these stones. “Sailing ships since the “Gold Rush” laden with supplies and sitting deep in the water just above the river bottom have inched their way slowly up the Sacramento River to Sacramento. 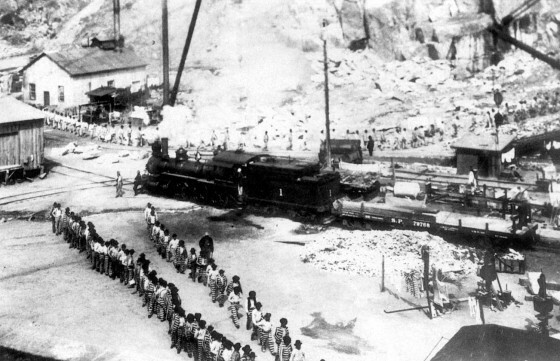 After unloading, the ships would risk rolling over because they were sitting high in the water without ballast to stabilize the vessel on its way back to San Francisco. The natural product to serve the purpose of ballast and a secondary cargo was “paving stones” or blocks which could be off-loaded in San Francisco Bay communities to pave the streets and work areas, thus keeping horses and wagons from sinking every winter in the mud. This entry was posted in Seattle Info and tagged Ballast, Folsom, Folsom Potatoes, Prison, San Francisco. Bookmark the permalink.